“My journey and success studying Jiu-Jitsu is what I’m most proud of in my life. My experience has been full and rewarding from the moment I stepped on the mat for my first class, to writing this. When my cousin joined Jiu Jitsu 10 years ago, after his best friend encouraged him to join, my parents thought it would be a good idea to enrol me in martial arts. As a small 5 year old girl who loved Bruce Lee, my parents thought that Jiu Jitsu would offer a fun, educational, and athletic way to spend Saturday mornings. 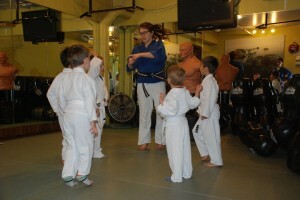 The martial arts training would also give me confidence in all aspects in my life. They could not have been more right. Through my childhood years it offered great learning experiences for me to not only develop my skills in basic martial arts, but also to develop me as a fast growing person. When I turned 13, I had an extreme interest in testing for my Junior Black Belt. It became my obsession, requesting my father to help me with my techniques every night at the dojo for many hours – along with the helpful guidance of Sensei Marc Burelle – as well as telling anyone who would listen how amazing my Jiu Jitsu training was going. I became so emotionally invested in fact, that when I accidentally missed my black belt pretest and was told that I couldn’t test that round, I broke down in silent tears. Fortunately, the instructor saw how dedicated I was to testing, an organized a private pretest with Sensei Steve Perron for me to qualify. I poured my heart and soul into that pretest, and worked myself so hard that I ended up being sick before coming out for more of the evaluation. I passed that test (Sensei Steve was impressed by my commitment to the test) and now I was to train for my exam. Every night after schoolwork, my training going through the modules would begin. My diet changed from carbs to protein, and I lost 20 pounds. Finally, the day of the test arrived and after calming myself down with the most zen music I could find on my iPod, I started the test. At first I was so nervous, wracked with performance anxiety and full of adrenaline the quality of my techniques were affected, but then instinct took over. I braved a cold, cramps, and a very sore body and after the test was done, my father carried my exhausted 13 year old body home and put me straight to bed. The next day was harder on my mind, but easier on my body – so afterward I treated my uki Alex Liepmann to DQ. After performing my demo with my father as my partner (including a creative original escape created by me) I went up to receive my black belt. 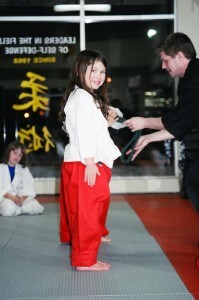 The moment Renshi Chris tied my black belt around my waist was one of the proudest days of my life. My life had been changed forever.